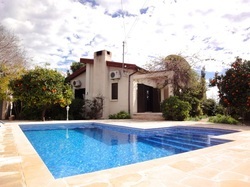 Located just north-west of Paphos, Tala afford you the ability to be very close to Paphos and because of gradual incline most properties have nice views of the Mediterranean sea. Tala is one of the more established neighborhoods or suburbs of Paphos and it has a nice village square with restaurants and tavernas. Size: 450 sq. m. "170 sqm covered + 15sqm uncovered verandas"
Lot Size: 948 sq. m.